Another way to find a Face Painter in the German directory is to scroll down to the list of Artists lower down in this page. 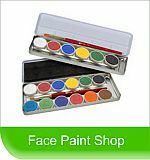 Are you a Face Painter? Our website aims to build a global resource for the face art world. 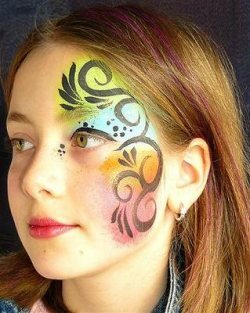 One of our goals is to build a global "face painters directory". Submission to the directory is Free and we would support the site by adding various adds to the site. This will have an advantage to the face artist of no setup fees. People looking for an artist, should find most face and body painters listed. We plan to give preference to the accredited artist, so as to have a quality listing. People will also be able to leave comments so a kind of peer and customer review should emerge in time. Are you an established artist, or up and coming Face or Body painter looking for some more on-line exposure? Do you have a great new creation of yours to share with the face art world? As long as it really is yours, Share it! (Add a link to your site in your text description. If the link works we will add it back to your site) The advantage of this directory is that it is free for the artist to list. This Directory offers clients anywhere on the globe, a way to search and find artists in any region or city. Tell us who you are, where you are based, website and whatever other details you would like to share. If you are accredited or belong to any face or body art organizations also please list this. Your submission will appear on a Web page exactly the way you enter it here. You can wrap a word in square brackets to make it appear bold. For example [my story] would show as my story on the Web page containing your story. Please note we have to approve all submissions. Submissions with accreditation from acknowledged face and body art groupings will stand a better chance of being accepted. Also note that the Submission Guidelines mentions that no links can be added. Please ignore this and do submit a link if you would like to. This is where you add a picture of your best or latest creation. Click the button and find the image on your computer. Then select the image. Note: Please make sure the name of the file is lowercase and with a name that describes it (not a name like "DSC12205.jpg") as many digital cameras create,but rather, something like "face-painting-butterfly-your-name.jpg". Please try to keep the file size to below 100K. Submissions bigger than this may not be accepted. You can re-size a file with most reasonable graphics programs, like Irfanview and you can Download Irfanview Here (if you need to). Re-naming a file is easy. Once you get to the point where you have found the file, right click on it and select . Then just edit the name of the file and enter. Then upload the file.